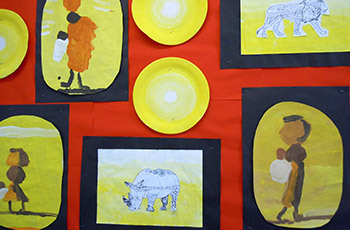 Children develop a range of artistic skills through curriculum work and specialist whole school art days throughout the year. They experiment with and develop their proficiency in using a range of tools, techniques and materials. They are also encouraged to develop their creativity, self-expression and independent thinking; which promotes high level of enjoyment and self-confidence. Within the art curriculum, children are introduced to the work of a variety of famous artists and given the opportunity to work with visiting artists. Children’s artwork supports and enriches other areas of the curriculum, and is regularly displayed including in our school art gallery. Summer Sculpture – using artists work to create their own work. Summer Seaside art and artists – Producing collages and artwork in the style of artists.